You know that saying life happens? Life happened to me in ways I never expected. I lost my job, then I thought my grandmother was dying but it turned out one of her employees had been murdered. I was adopted by a Jack Russell Terrier and a calico kitten, and I broke up with my boyfriend. Talk about major life changes! juvenile and just plain awful! I'm not particularly prissy and don't fancy myself a princess or anything, but a text? Really? No kiss? No daisy? No clever surprise? I think it was the subsequent pity proposal that woke me up. As I explained to Ben, I appreciated his kindness but I don't want to marry someone who feels sorry for me. I want to marry someone who loves me, warts and all. Happily, I don't have any warts of the frog kind . . . just the baggage we all have. You can read all about it in MURDER, SHE BARKED. So here I am in Wagtail, just in time for their huge Howloween celebration. I drove in a few hours ago. My entire life, except for Trixie, my dog, and Twinkletoes, my kitten, is in a box or a suitcase, all jammed into my apartment on the third floor of the Sugar Maple Inn on Wagtail Mountain. In case you haven't heard (I didn't know until a month ago! ), Wagtail is the premier destination for people who want to vacation with their cats and dogs. The inn even has a special cat wing with trees on the screened porches! My grandmother, whom I call Oma, German for grandma, invited me to become her partner. She'd like to take some time off, which she proved by running off somewhere and leaving me to help check in the Apparition Apprehenders, a ghost hunting team! I don't believe in ghosts but I don't think I'll tell them that. Not yet, anyway. I'll let them have their fun. How about you? Do you believe in ghosts? 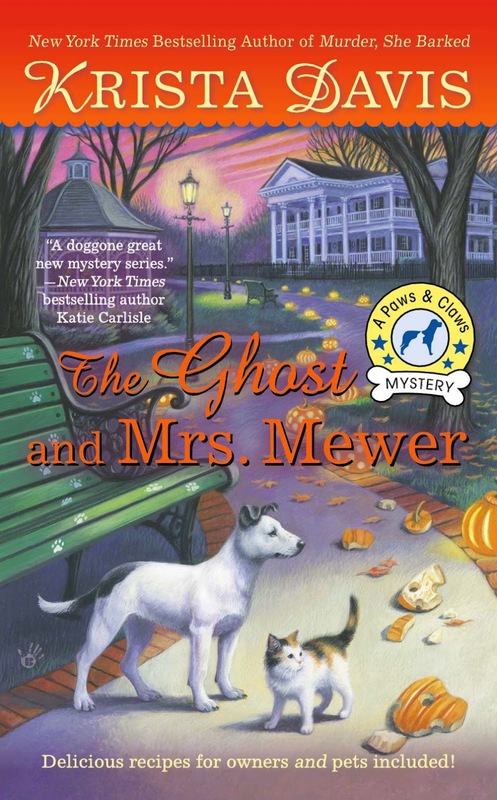 THE GHOST AND MRS. MEWER won't be here until December, but you could win a copy of MURDER, SHE BARKED or THE DIVA WRAPS IT UP! Your choice. One lucky person who leaves a comment here before midnight will win a signed copy. Good luck and be sure to leave an email address in your comment so Krista can contact you! I don't believe in ghosts, either, but I do love books with cats and dogs and mystery. I'm with you (and Nancy above). I don't believe in ghosts, but love a good mystery! Thanks for the chance to win. Sounds like a fun series. No ghosts here, although I do love a good fake ghost story. carstairs38 at gmail. 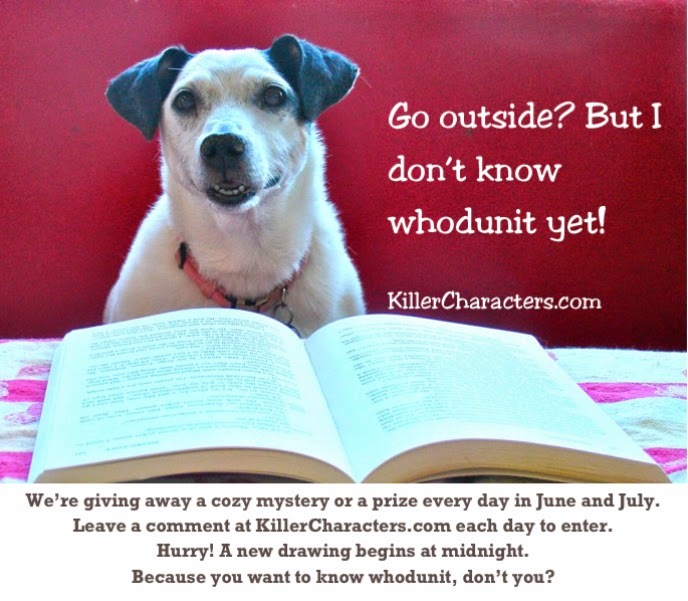 I don't believe in ghosts but I do love a good mystery—thanks for the opportunity to win one! I am not sure I believe in ghosts but I do not disbelieve either. I have an open mind. Looking forward to reading about Holly's next adventures. I know something exists as I had frequent visits from my friend. I'm not sure if I believe or not. Like Debby, I have an open mind - no jokes intended, of course. Am smiling re Howloween and Wagtail. Can't wait to read the rest! Love cozy mystery. I don't believe in ghosts. Can't rule out that ghosts aren't real, so I'm looking foward to reading this book. I do believe in ghost/spirits. Many in my family have had experiences with them especially my mother. I love your books and excited to read this latest one. I do not believe in ghosts, but I love the concept of these mysteries. Can't wait to try them! I am not a disbeliever nor a believer in ghosts, just don't know. "I do believe in ghosts, I do, I do." I've had personal experiences, as have people I know. I'm also a fan of Ghost Hunters and actually went on a ghost hunt with a local paranormal team! I can't wait to read this book. I loved the first and this one sounds fantastic! I'm not sure about ghosts. Keeping an open mind! I'm keeping an open mind about ghosts, too! I don't think ghosts are real but love reading mysteries about them. I like reading about ghosts but don't expect to ever see one. Animals are supposed to be much more sensitive to the paranormal then humans. I've sensed spirits every now and then and we had a resident family ghost living with us till the kids were in their teens. I think these books would make a great addition to my home library and I'd love to win one. Cozy ghost stories are some of my favorite to read. I just love them. I love all of your books and can't wait to read this one! I'm not sure about ghosts, but my husband is a true believer in them! Keeping an open mind -- love the titles!! such cute covers, too. I have eye this series for sometime. Must put on TBR LIST. Thank you!! I love your books! Love books with animals. thanks for the chance to win. I believe in ghosts, but really hope to never see one!!! I do believe in ghosts. My family shared a house with one for about five years. I never came face to face with it, be he made himself very clear in the things he did. Thank you, Krista for the chance to win one of these great books. I love your books. As far as ghosts?...well, I will leave them alone If they leave me alone. Can't wait to read more! Thanks for the great giveaway. Both of Krista Davis series ate great. I really enjoy them. Another terrific series - and the titles crack me up. I think I don't believe in ghosts, but I really do. I want to move to Wagtail. It sounds like a wonderful place. I might even like the ghosts there---I do believe in them. I do believe in ghosts, have had experiences in the past. Thank you for the chance to win! I haven't tried the Paws and Claws series yet, but I love the Diva series! A chance to win is much appreciated! Anything is possible if you believe. I believe you will let me win this terrific book. Go outside when there are books demanding my attention? I think not! I don't believe in ghosts. But I do think some unexplained stuff happens sometimes. I don't believe in ghosts, but I do love good mysteries with cats and dogs.. especially cats!! I am adding this series to my new list of new reads. Thank you so much! I am a full believer in ghosts as I have several in my life at various times. I have seen the evidence , heard them and see them all the time. So I adore these books! Thank you for the chance to win. Such a great blurb. Win or loose I will definitely be reading this book! Thank you for offering us a chance to win a copy of one of you books. Love mysteries with Cats and sometimes dogs in them. This sounds like a good book. Love ghosts! Can't wait to read this one! The Ghost and Mrs. Muir was one of my favorite movies growing up...Thanks TCM! I would have to have this book for the title alone! I'm keeping an open mind about ghosts, but I love cozy mysteries. I love Krista Davis' books. I love animals in cozies. Love cozies especially with cats and dogs. Shame the inn isn't real; I'd bring my cats for a visit. I'm open-minded as far as ghosts are concerned. 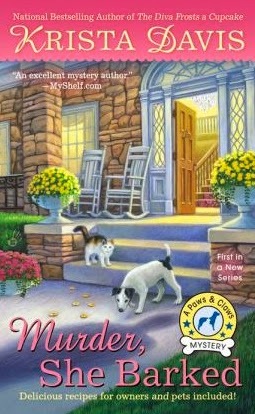 Love cozy mysteries. Not so sure about ghosts but am open minded. Quite intrigued.... will definitely check out Murder She Barked. Woof". I want to win. Murder she barked defintely looks like my type of book. Love ghost stories. I cant wait to read this one. I do believe in ghosts and love ghost stories, can hardly wait. ghosts?! i'll bet the JRT could dispatch them! I don't believe in ghosts, but I did grow up in a house where strange things happened regularly. Can't wait until December. Sounds like another great book.